"Sharks are the stuff of nightmares." There's actually a disclaimer at the start of one of the six episodes on this two-disc set that reads: "The following program contains shark interaction performed by professionals. These activities should not be replicated." If there was ever a more fitting "duh!" statement I'd be surprised, as the real appeal of the Discovery Channel's yearly Shark Week programming blocks is that all of us slothy armchair bozos can get a healthy dose of education and awe on those often maligned toothy predators of the deep while keeping a safe distance from actual open water. I know that's the way I prefer it. Shark Week: Ocean Of Fear runs the gamut content-wise, and over the course of just over six hours provides a chilling recreation of the events that followed the sinking of the USS Indianapolis during World War II. While largely done with recreations (something I typically dislike to no end), it is simply difficult to not sit with slack-jawed disbelief at what the men of the Indianapolis endured in order to survive. The accounts of what transpired�especially if you're not familiar with the real-life story�will no doubt have you imagining "what if that were me?" I've read a few books on the sinking, but the story never ceases to chill me to the bone. After this grim opener, the remaining five episodes are almost light by comparison, as they analyze why sharks are such ideal killing machines, a truly nutty tribe in New Guinea that is chock full of so-called "shark whisperers," and naturally, an in-depth look at some really gruesome shark attacks. Man's perverse fascination with sharks got a real jumpstart from the film Jaws, and while much of what the average mope thinks they know about sharks is incorrect, that has done little to quell our apparently insatiable demand for all things sharky. Hence, Discovery Channel's Shark Week, I suppose. I recently stayed on Martha's Vineyard (where much of Jaws was shot) for a few days, and during our visit there was a huge shark fishing tournament underway. There was a weird big-crowd-bloodlust at the end of each day as the sharks were hauled up to be weighed (and then slaughtered), and the vibe was almost like we were watching some horrible criminals being strung up and lynched. But they're just sharks, doing what sharks do, living the way sharks do. 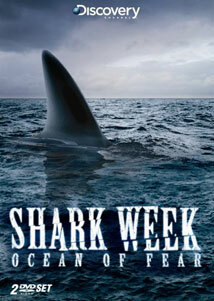 And over these six Shark Week segments, that's the underlying message. They're not necessarily nature's villains any more than they are first-rate predators with some very sharp teeth. At the conclusion of Ocean Of Fear: Worst Shark Attack Ever, narrator Richard Dreyfuss mentions the minuscule number of fatal shark attacks on humans when compared with the staggering number of sharks killed by us. But I guess Human Week doesn't have the same ring. Image Transfer Review: All six episodes are presented in 1.78:1 anamorphic widescreen. There's a marginal variance in quality across the set, with some carrying measurably brighter colors than others (case in point: Shark Feeding Frenzy). Image clarity and sharpness waffles a bit as well, though none come close to looking particularly awful. Overall, the underwater sequences�even those shot under some seemingly wild conditions�look clear, with no visible print flaws or debris. Audio Transfer Review: All episodes have been issued in 2.0 stereo. Nothing flashy or showy here, just generally clear and pleasant timbre on the assortment of narrators (including Richard Dreyfuss), along with a modicum of bass during a few of the music stingers that help sell the toothy drama. Extras Review: This two-disc set is packaged in a clear plastic hinged case, adorned with a slipcover; the artwork is identical for both. There are no supplemental materials whatsoever.